You're observing the freshly fallen snow at your location. While the scene can be breathtaking, how does that blanket of snow affect temperatures afterward? In most cases, sunlight reaching the Earth's surface causes temperatures to increase throughout the day. 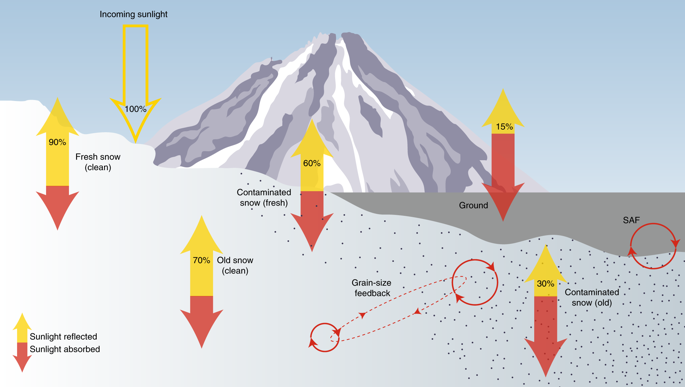 When snow covers the ground, the incoming radiation is reflected into space. The amount of solar radiation that an object reflects is known as its albedo. For a fresh snowpack, the albedo can be as high as 80-90%. Therefore, much of the incoming radiation is reflected into space, keeping the surface colder. Notice in the image above how much more reflective snow is than the ground. This effect is the reason that skiers can get sunburns in the middle of winter! If there were no snow cover, the soil would absorb that radiation and would warm the surrounding air. Because the snow tends to reflect this radiation, high temperatures are usually lower than what they would be without snow cover. On the other end of the spectrum, snow cover can also affect overnight low temperatures. After the sun goes down, the heat absorbed by the snow cover is radiated back into the atmosphere, allowing temperatures to fall more than if there was no snow on the ground. Another effect is that the snowfall tends to act as a blanket, preventing the heat in the ground from escaping and leading to overnight lows to be colder than they would be otherwise. Visible satellite imagery can be useful in observing snow cover during the day. While clouds in the area will move, the snow will remain nearly stationary until it melts. It will also be a brighter shade of white. In some cases, snow cover will make geographical features like rivers and lakes stand out on a visible satellite image. If it fell in an area with dense vegetation, however, the snow may not appear on satellite imagery. Freshly fallen snow can be a sight to enjoy. Just don't forget that it can drastically affect temperatures, both during the day and overnight. Be prepared for the colder temperatures while the snow cover lasts!